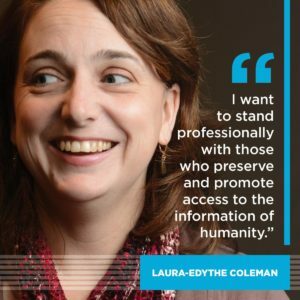 Dr. Laura-Edythe Coleman is an American researcher who bridges the fields of library science and museum studies to further our understanding of cultural institutions in society. She earned her Ph.D. in Information Science with a focus on Museum Informatics from Florida State University. Dr. Coleman holds posts as an online lecturer for the Graduate Museum Studies Program at Johns Hopkins University and as adjunct faculty for the School of Information at Florida State University. Her areas of research and teaching include cultural heritage informatics, social justice and inclusion, knowledge management, information architecture, information needs and seeking, research methods, collections management, and museum studies. As a forward-thinking LIS researcher, she performs quantitative and qualitative studies and frequently forms research partnerships outside the library and museum fields. Dr. Coleman is a recent addition to the Fulbright Specialist Program for Library and Information Science, and she is the new Associate Editor for Curator: The Museum Journal. She is the author of Understanding and Implementing Inclusion in Museums.